Elizabeth Campbell Books is Kenora Ontario’s oldest and largest bookshop with a stock of over 40,000 used (and a few new) titles. Although our stock is diverse, we have a great selection of First Nations, Archaeology (mostly Canadian), Northwestern Ontario, Christian and Children’s books. You are welcome to shop online (click the link above) or to drop in and visit us when you are in the area! Monday – Thursday: By Appointment. Please contact us via email with your phone No. Friday: 11:00 a.m. – 4:00 p.m.
Find us at 129 Main Street, South. 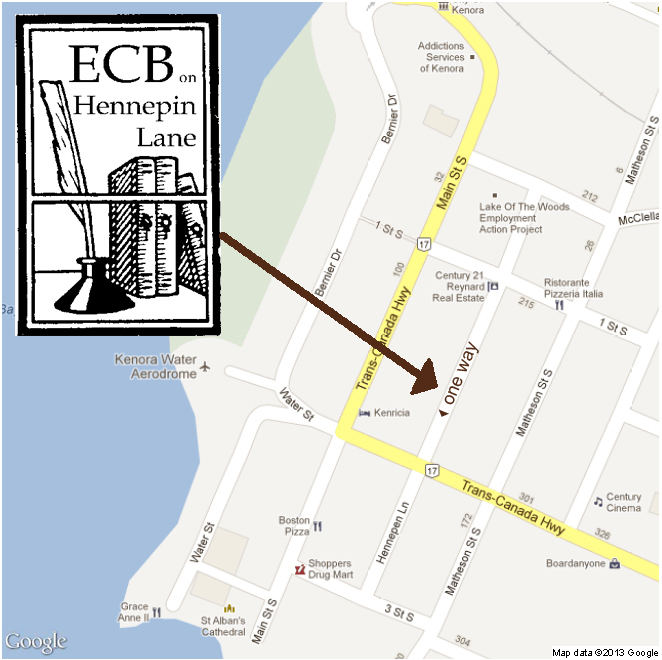 Limited free parking and entrance on Hennepin Lane.